Cross Border Book Talk with Karen Dionne – TOMORROW! The front window at Biblioasis – all ready for our wonderful event! Please join us for a spectacular event at Biblioasis! 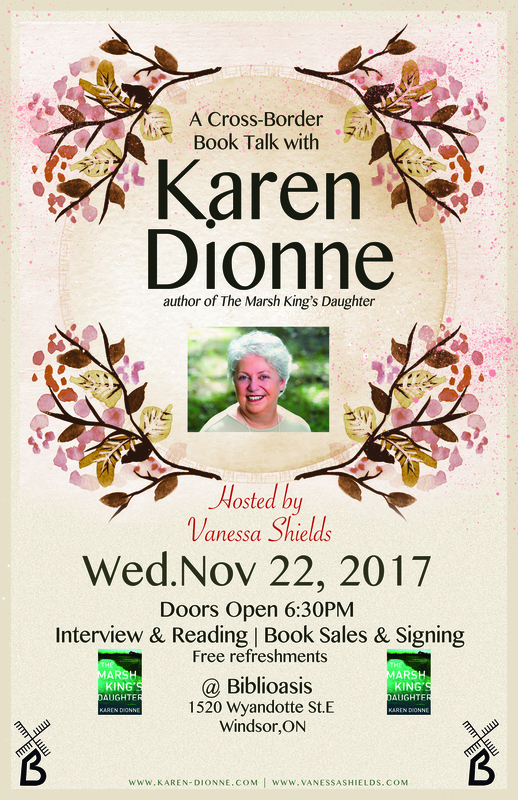 I’m hosting the great Karen Dionne – author extraordinaire for an intimate interview. Karen will answer all my probing questions then she’ll read for us, and then she’ll sign our books! We are offering *free* wine, coffee, tea and scrumptious treats from the Riverside Pie Cafe. As well, Karen will be giving away *special* copies of her new book The Marsh King’s Daughter. I tell you, this is not an event to miss! Yes, I know there’s a big hockey game on. I know! But, like, you can TiVo that, right? You can’t TiVo this incredible literary event. And I promise you that the Riverside Pie Cafe’s scones are better than any chicken wing you’ll eat. Am I right?! Karen’s book continues to get RAVE reviews across the globe! Join us and find out about Karen’s writing process, her idea well, her reaction to finding out her book has been optioned for a film! I tell you, it’s gonna be wonderful. And totally inspiring. You doing NaNoWriMo this month? I guarantee this event will help your writing along! So, here’s our Facebook event listing: let us know you’re coming! From 6:30pm – 9pm – intimate talk, reading, book sales and signing. We’ll invite you to ask questions too! We look very forward to seeing you tomorrow evening! Thank you to Biblioasis for sharing your space with us! Previous Post An Interview with Author Karen Dionne & Event Info! Next Post Brace yourself! Upcomings and more!